Apart from Popeye, many people neglect spinach and its health benefits. Now, spinach chips may be a way to incorporate a love of spinach to a generation or group of people, least likely to eat the healthy vegetable. Right now, many people love kale. Kale chip, kale salad, kale smoothies, etc. But one cannot live on kale alone, and hence the appeal of spinach chips. These chips are lightweight and crispy. Some have never heard of spinach chips before; and others wonder how to make spinach chips. This snack can even be made more quickly by using pre-washed baby spinach. One serving only has 75 calories, a much healthier alternative to potato chips. 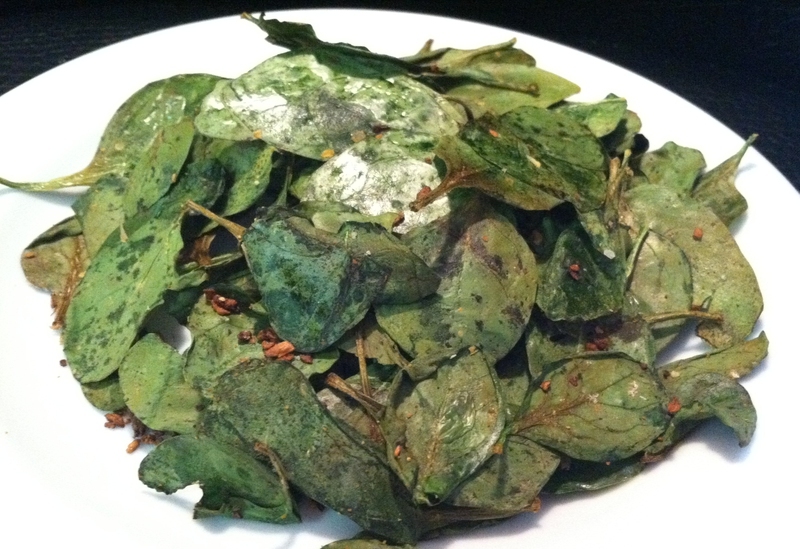 Spinach chips are relatively easy to make. One serving consists of 75 calories, with 7 grams of fat, 2 grams of protein, 2 grams of carbohydrates, and 1 gram of fiber. I believe after this people will never ask how to make spinach chips again. The recipe is very simple to follow. The spinach chips recipe begins with preheating the oven to 325 degrees Fahrenheit and then lining a baking sheet with parchment paper. Next, toss spinach leaves and olive oil together in a bowl. Sprinkle garlic powder and sea salt to add taste. (Or add additional seasoning to your taste.) Then, arrange the leaves on the baking sheet in a single layer. Place them in the oven and bake for 7-10 minutes, or until the leaves have darkened and started to crisp. Finally, remove from the oven and wait 5 minutes to cool. Enjoy! (In some cases, the chips were found to lose crunchiness after a few hours). Spinach is an essential, although neglected vegetable. It can be acquired year round, although it is in season during the spring. It is known for its health benefits in restoring energy (as green vegetables are known to do) and improving the blood quality. Spinach has a plethora of minerals: iron, magnesium, and manganese; and vitamins K, A, C, and B12. Vitamin K is vital in maintaining bone health, and no vegetable has a higher concentration of vitamin K than spinach. Wash before consumption (due to possible chemicals in the stems and leaves), but not before storage (as the water hastens the decaying process). The taste of raw spinach is more mild than the cooked alternative; many cooks recommend steaming the vegetable to preserve nutrients if you are not a fan of spinach chips.